Breaking down the closed beta times for Mortal Kombat 11 and how to participate. Before its release on April 23, there will be a closed beta for Mortal Kombat 11. With this beta, participants will be able to test out Mortal Kombat 11 and get a feel for its gameplay. Unfortunately, because this will be a closed beta, only select gamers will be able to access it. Looking to participate but aren’t sure how to register and participate? We’ve got you covered! Below, we’ve put together a guide on how to access the upcoming closed beta for Mortal Kombat 11. NetherRealm Studios has provided an image that outlines the start and end times for the Mortal Kombat 11 closed beta, as well as all participating regions. NetherRealm Studios recently provided an image which outlines the closed beta times for Mortal Kombat 11 across various different regions. The closed beta will be available on both Xbox One and PlayStation 4 (sorry PC users), and will be available in regions including the US, UK, Europe, and Asia. Below, we’ve listed the closed beta start and end times for each region as noted by NetherRealm Studios. Begins on March 27, 2019 at 8:00 (PST). Ends on March 31, 2019 at 23:59 (PST). Begins on March 27, 2019 at 15:00 (GMT). Ends on April 1, 2019 at 7:59 (GMT). Begins on March 27, 2019 at 16:00 (CET). Ends on April 1, 2019 at 8:59 (CET). Begins on March 28, 2019 at 2:00 (AEDT). Ends on April 1, 2019 at 17:59 (AEDT). To access the closed beta for Mortal Kombat 11, you'll need to pre-order a copy of the game for either Xbox One or PlayStation 4. 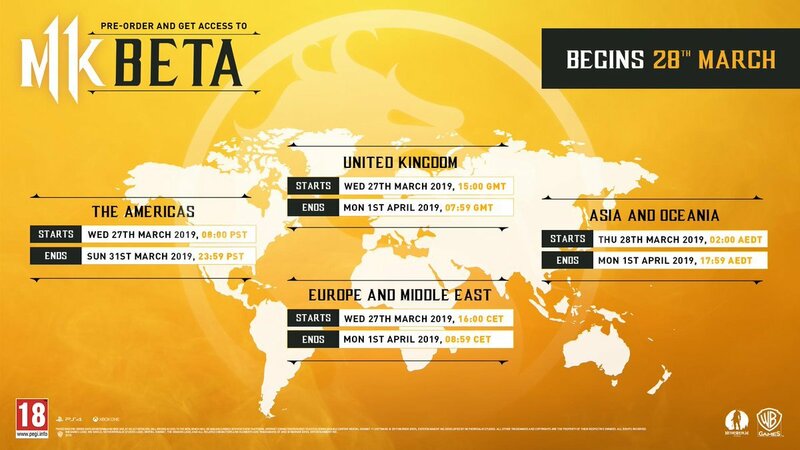 Now that you know the scheduled times and participating regions, the next step is learning how to qualify for the Mortal Kombat 11 closed beta. To gain access to the Mortal Kombat 11 closed beta, you’ll first need to pre-order either a digital or physical copy of the game for either Xbox One or PlayStation 4. The easiest option of the two is pre-ordering a digital copy, as you won’t have to run through any additional steps. Instead, you’ll be able to download the closed beta through your system’s storefront, and will be able to access it once it goes live in your region. If you’re intent on pre-ordering a physical copy, you’ll be given a redeemable closed beta code either printed out at the time of purchase, or sent to your email. When you have your code, you’ll need to redeem it via your system’s storefront. Like the digital pre-order, redeeming this code will allow you to download the closed beta, and access it once it goes live in your region. Again, keep the start and end times in mind, and remember that the Mortal Kombat 11 closed beta is only available on Xbox One and PlayStation 4. 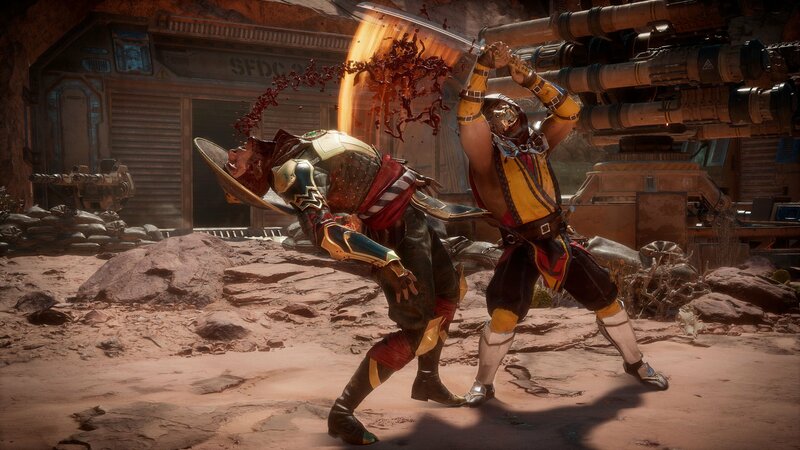 Now that you know how to access the Mortal Kombat 11 closed beta, be sure to check out some of our other guides including the roster of all confirmed characters in Mortal Kombat 11, a look at one of the newly confirmed characters called Geras in Mortal Kombat 11, and the return of Skarlet and Baraka in Mortal Kombat 11.